Daniel, how well giving Sudetenland to Hitler work for anyone, and why do you think submitting to Putin’s invaders will work better? 1. As it was said already, the present ethnic situation is a direct result of Soviet ethnic cleansing and Russification policies. It would be a villainy to adhere to the principle “might makes right” and reward those policies. 2. The present internal boundary is not something historic and stable. 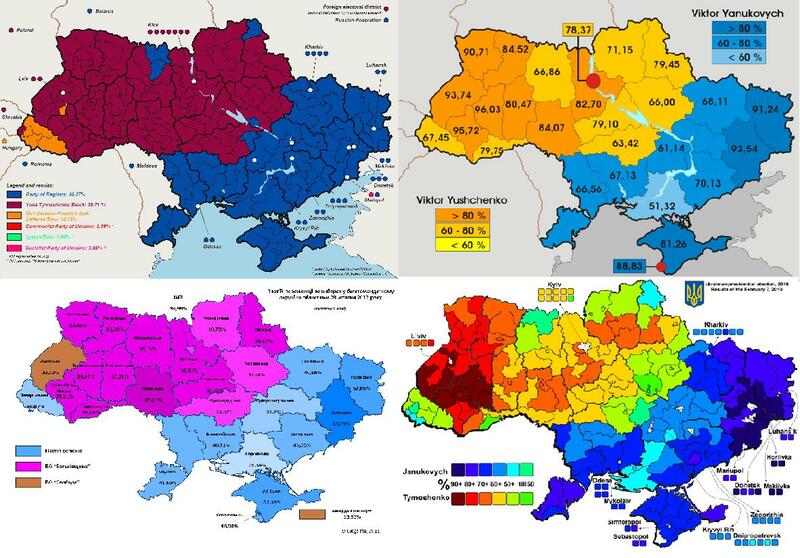 In fact, it is rapidly moving East and South — compare electoral maps of 1991 (http://en.wikipedia.org/wiki/File:Ukraine_presidential_elections_1991.png), 1994 (http://en.wikipedia.org/wiki/File:Ukraine_presidential_elections_1994,_second_round.png), 2002 (http://uk.wikipedia.org/wiki/%D0%A4%D0%B0%D0%B9%D0%BB:%D0%92%D0%B8%D0%B1%D0%BE%D1%80%D0%B82002.gif). 4. As for Crimea, let’s remember the native population of Crimea is Crimean Tatars. They were rounded up to the last soul and deported by Russians to Central Asia in 1944. A half of the nation perished during the genocide. If somebody has a say about Crimea, it ought to be Tatars. Ukraine is in a very tough spot. Sandwiched between authoritarian Russia with annexation aspirations and the declining European continent which wants to absorb Ukraine into its moribund growth customs union. Yes, the best choice for Ukraine would be independence and federalism/partition. But don’t hold your breath. The Ukrainians themselves are very statist people. A population cannot shed several decades of statism, notwithstanding the falls of iron curtains and colored revolutions. The psyche of these societies remains deeply steeped in coercive collectivism. In these ex-communist societies, there is a typical temporary backlash against the specific type of coercive collectivism that brought about the wretched decline, only to soon embrace a slightly different version of coercive collectivism. For the overwhelming number of societies, the road to coercive collectivism is a one way street. That is why these countries, eg. Russia, simply flip-flop between different versions of coercive socialism. Red flags, black flags, blue flags, green flags, hammers, sickles, swastikas, uncle Joseph, uncle Vladimir,…the slogans and details change but the essence remains the same: Citizens remain slaves to supreme rulers, commissariats, commeettees, or a pitchfork holding majority. I.e. You, your life, your vitality belong to society. The only quarrel is the details of how the individual will be used to serve the whole, and who is going to manage it. So these societies simply flip flop between different ideas about how to forcibly absorb the individual and his vitality into centrally planned collective plans. And it never works. Only enough time passes to forget past failed attempts and then the cycle repeats. Yes, there is overall progress towards more freedom on a worldwide basis– after all, Darwinian natural selection of successful cultural traits cannot be stopped — but the progress is very slow. America had once been spared this almost universal fate. But copying the rest of the world is the one way road America is slowly moving towards. But the pace will inevitably accelerate, as the incline of the slippery slope has now surpassed the friction coefficient. Past a certain point, collectivism takes a life of its own and things fold quickly. But true rebirth remains elusive after the one way transformation. the Ukraine is dead broke…. no money… flat busted… Egypt without the Saudi sugar daddy… American interests have whizzed away over 5 billion dollars in the last decade in hopes of influencing political events in Ukraine… for what? the eastern part of the country sports soviet era industry which is non-competitive in the world market place… and the west is sucking-up to a bankrupt Europe? pretty funny stuff… as long as the American taxpayers are not expected to pick up the tab……………. There are a couple of problems with partition. The first is that Ukraine proper would lose sea access. 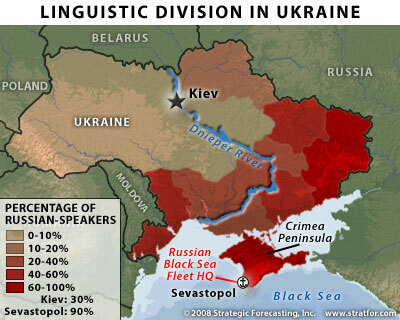 The second is that, as i understand, the Russian-majority areas are a product of Stalin’s ethnic cleansing. Partition would send a message to posterity that ethnic cleansing works. That’s not to say that the Swiss solution is ideal. In my opinion, every country should strive to be more like Switzerland, constitutionally speaking. However, there are no Swiss cantons in which Russia has a strategic interest. The same cannot be said of Ukraine. Any realistic solution should take these interests into account. I’m going to miss Tom Clancy. His most recent book predicted all of this. 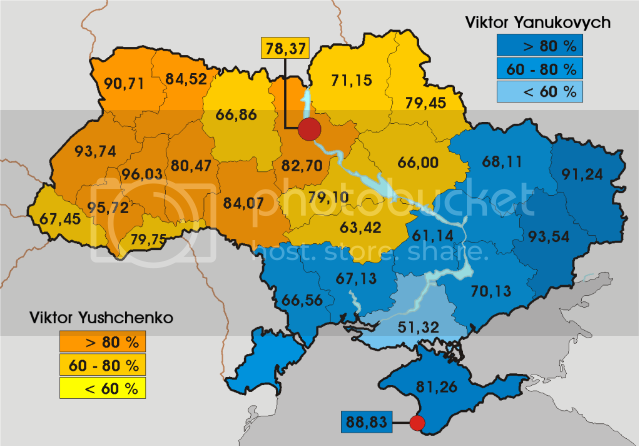 I would favor the Swiss approach, but secession will probably be the result for two reasons: the Ukrainian politicians on each side will want to retain what central power they can; and the Russians will want one entity that they can manipulate, not a bunch of independent canton-like states.